Designed to restrict "Pulling" by applying pressure at the chest when you need it, and restrict the dog's forward movement. 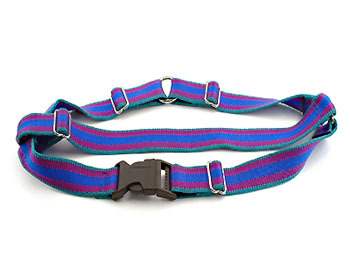 Fully adjustable for a more comfortable fit for your dog. X-Small- fits chests measuring 13" -19"
Small- fits chest measuring 16"- 22"
Medium- fits chest measuring 20"- 28"
Slip the "Easy Walker" Walking Harness over the dog's neck so the large "O" ring is positioned on the dogs chest. Everyday use. Matches our solid nylon color collars.